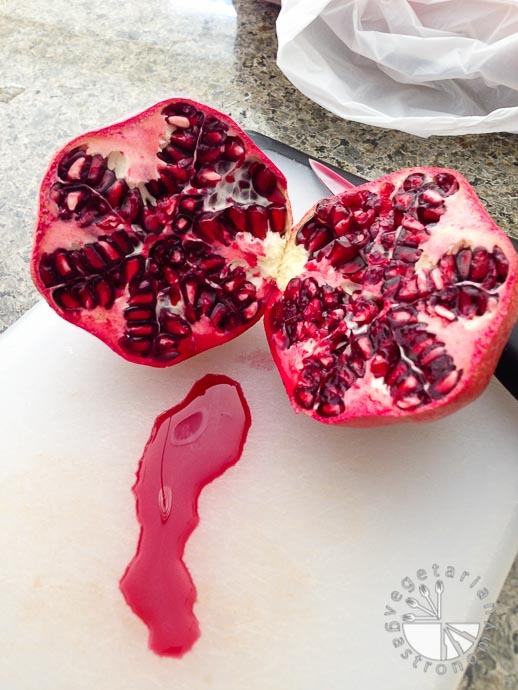 It’s that time of the year for one of my favorite fruits… the Pomegranate! We became new homeowners a few years ago and decided to tart a small garden. 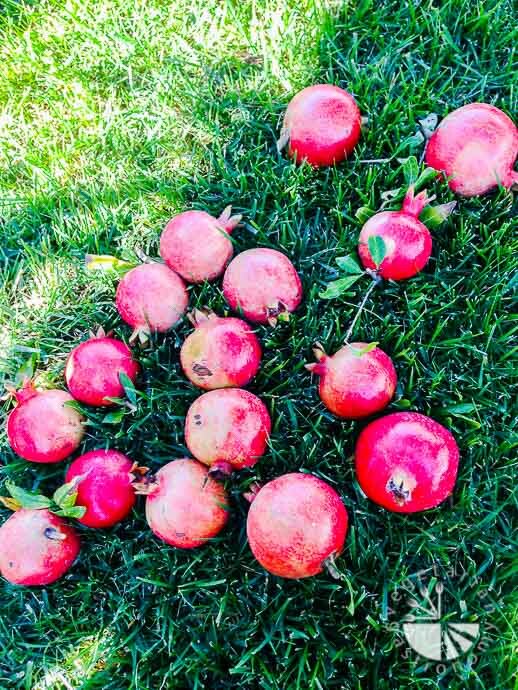 We planted citrus fruit trees, vegetables, herbs and one of my favorites… a Pomegranate tree. Overall, our vegetable and herb harvest this year was spectacular (I will post about our garden soon), but our citrus trees were only mediocre. Although our lemons are slowly coming in, our Pomegranate tree more than made up for it this year!! 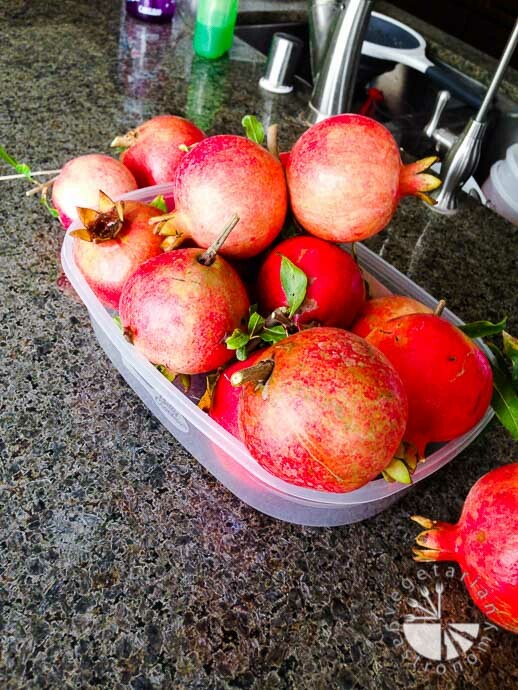 Aside from the tomatoes, it was the highlight of our garden, producing 30+ delicious, sweet, large pomegranates! The tree itself is absolutely gorgeous (I shared a few pictures of the tree on my How-To-De-seed-Pomegranates post). Last year, our tree gave us only 6 pomegranates, but this season was a wonderful surprise. I was finally able to reap the benefits last week after de-seeding 5 Pomegranates. Living in San Diego, where weather is almost close to perfect year around, we’re still enjoying the last of the heat, soaking in those last few days at the beach and in the water. Nothing sounded better than a refreshing beverage after spending two days at the beach with my kids. With all the pomegranates staring at me and ready to be eaten, I decided to make myself some lemonade using the pomegranate seeds, lemons, and mint from my yard. 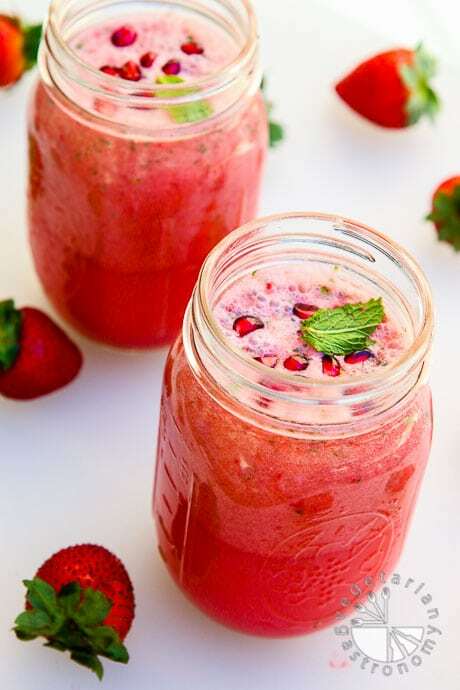 I made fresh light pomegranate juice and pulsed it with some fresh strawberries, mint, and ice cubes to make it cool and slightly thick and chunky instead of completely blended, because I love the taste of fresh fruit in my lemonade. I also used a little maple syrup and fresh lemon juice to balance out the acidity and sweetness. Feel free to adjust the amount of fresh lemon juice and maple syrup to taste. The resulting lemonade was very refreshing, not to mention quick and easy to make with the use of my Vitamix. Aside from eating the raw pomegranate seeds, which my daughter and I love to do, this is the perfect first simple recipe to make using my homegrown Pomegranates. My kids loved this refresher as an afternoon drink, and my husband was pleasantly surprised with a glass when he came home from work. I can guarantee you there will be a few more recipes using Pomegranate seeds coming on the website soon, especially since I have many more to de-seed! On a side note, I recently came back from a 3-day girls weekend to Portland with my sister-in-law and cousin. I loved the city! Everything about it was wonderful… the people, the weather, the greenery, the food, the coffee… did I say the FOOD!! If I wasn’t quite settled in San Diego with my kids, I would’ve loved to have spent time living in Portland. We went everywhere by bike or foot. The first day we walked around, exploring different neighborhoods, eateries, and coffee places. The next day we spent biking around the entire city and exploring across the river for 5-6 hours. The city is extremely bike-friendly. I mentioned how refreshing biking has been for me on a previous post, but now I can honestly say I’m addicted. I need to get some type of a bike ride in every other day, even if it’s just for 20 minutes riding with my daughter. It takes me to a great place where I feel awesome. So back to my Portland trip. I had the chance to re-connect with an old elementary school friend who just happens to be the Director of Coffee at the Portland Roasting Company. He offered to give us a tour of the roasting facility, and I now have a new found appreciation for coffee and learned how it’s picked, made, and roasted. I’ve been on several coffee plantation tours in Hawaii before, but this was more in depth experience. He really dove into how they make their blends, pick their beans, taste for flavor, and roast their beans. Do you know how decaf coffee is made? I never knew myself until that tour and it’s amazing how much of the entire process is a science. He even served us our first ‘pour over coffee’ at their cafe, The Cupping Room, attached to the roasting facility. Their coffee was spectacular. Portland and it’s coffee inspired me so much that I convinced my loving husband to get me a Breville Barista Express! I’m so excited to start using it. I’m sure you’ll be seeing a few recipes with shots of espresso in the near future. The list could probably go on-and-on, but we were only there for 3 days. 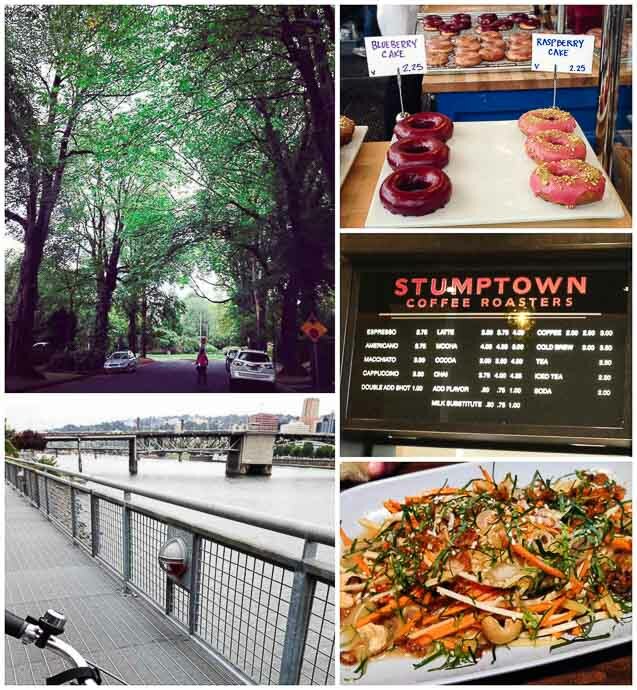 I already have a list of places to try on my next trip to Portland! 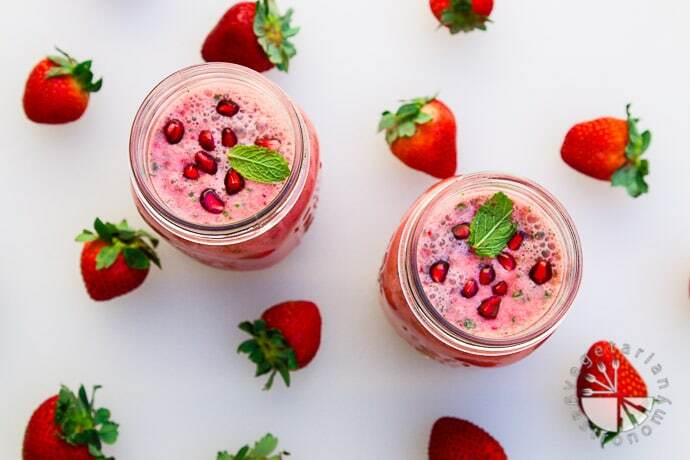 Now back to this delicious refreshing Pomegranate Strawberry Mint Lemonade… yum! 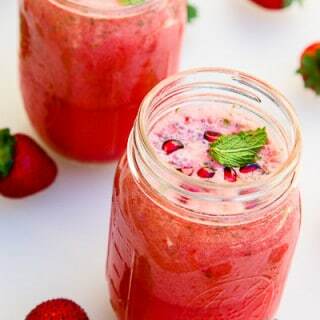 There's nothing like the refreshing flavors of fresh pomegranate, strawberry, lemon, and mint! Make a pitcher and enjoy it throughout the week! 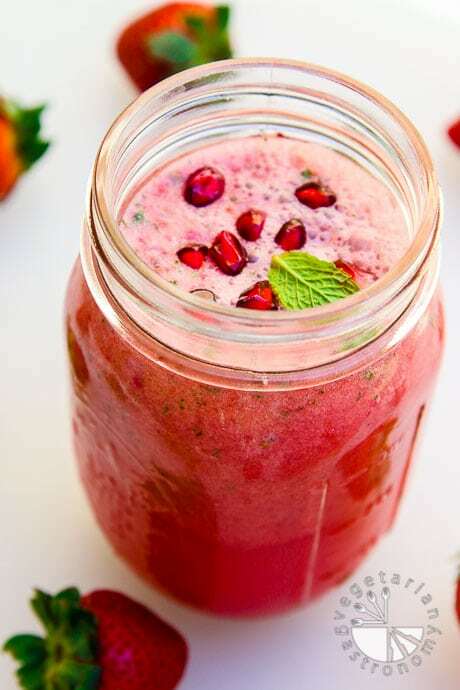 Using a vitamix or blender, completely blend/puree the water with pomegranate seeds. If you do not prefer to have any white parts of the seed intact, strain the blended liquid. Otherwise, slowly pour out into a bowl, leaving behind any remaining intact white seed parts (most of them should have settled to the bottom anyway). Rinse your blender or vitamix out with water to remove the remaining seeds. 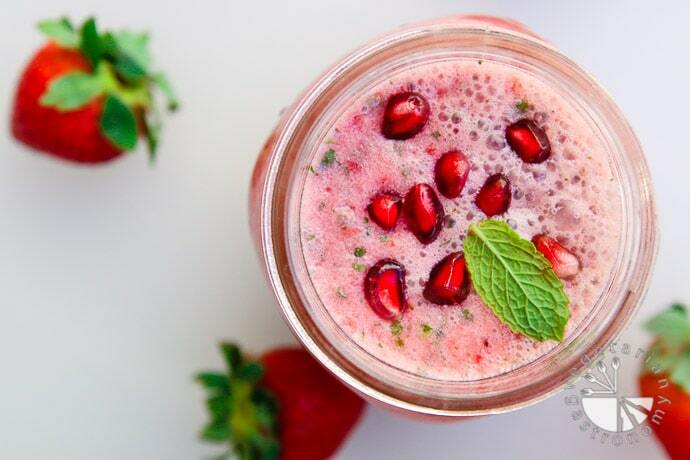 Add the blended pomegranate juice back into your vitamix. Add the strawberries, mint leaves, lemon juice, maple syrup, and ice cubes. Pulse the vitamix 3-4 times until the lemonade is combined and blended, but still slightly thick and chunky with small pieces of mint and strawberry remaining intact. If needed, adjust the amount of maple syrup and lemon juice to taste. Serve cold. Fresh lemonade is always awesome! So glad you enjoyed the recipe and were able to modify it based on what you had. Thanks Sheenika! We have pomegranate tree.very sweet. With mint-lemon test was very good..